Arctic Cooling was founded about six years ago in Switzerland. They have locations all around the world. Since their inception, they have been providing quality products to companies and end users. I have their Freezer 7 Pro LGA 775 cooler on the bench today for review. It is pretty well designed and performs well. Arctic Cooling packages their products in a distinctive black box with the product on the exterior. Very nice. As this is a CPU cooler, you get the cooler, some instructions, and a case badge. Basically you install the heatsink correctly and you are good to go. What is a sone? It is a measure of loudness instead of sound pressure. On a dB scale, this fan should produce about 28.2 dBA. Sone to dB is not linear. Even so, this is a quiet unit. The cooler itself is fairly large. I was previously using a Scythe Kamakiri cooler to provide cooling for my system. That heatsink was also extremely large. What really caught my attention were the LGA775 style clips. I HATE THESE CLIPS with a passion. When I first saw them on a normal Intel generic heatsink, I thought it was okay until I actually attempted to install it. My friend also had similar feelings with broken clips, clips that bent, clips that would not close, and other issues. If there was a solution that did not use these clips, I would overly recommend it. 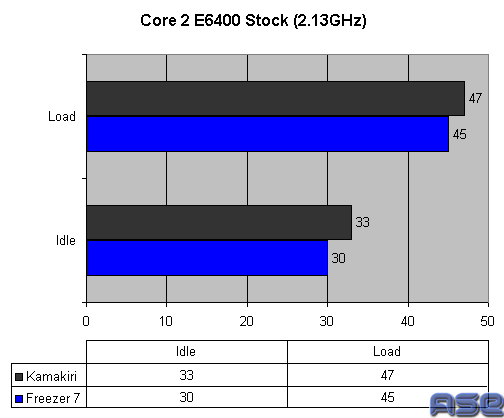 Why did Intel move off the old 478 style heatsink solution when it was so good? The cooler itself is made with the bigger is better approach. This actually works since the more surface area to dissipate heat, the better. Normally a unit this big would not be able to transfer that much heat between the bottom half and the upper portion. This unit uses a series of heatpipes to pump heat to the upper layers so the entire heatsink can release the heat. This also brings the heat away from the hottest spot, the contact point with the CPU. Heatpipes are great in heatsinks and have been since they were introduced on products a few years ago. The base of the unit was lined with the MX-1 paste which I will review next week in full. It was left on to test the heatsink as purchased. The bottom is copper which is an excellent conductor. The unit actually cools by blowing air through the side of the unit. Since the cooler is so tall, the fan would not work on the top. Allowing the airflow to pass through the fan is also better for cooling since the airflow flows naturally through the entire heatsink. On heatsinks that mount the fan on top, the airflow gets blocked at the bottom and this impedes airflow. The other good thing is that the nice "S" airflow in the case is kept intact with this cooler. The exhaust fans in the case should pull the air themselves from the unit as well. The fan itself is also a highlight. It is a 92mm fan that is caseless. The great part of the fan are the mounts. The mounts are rubber and are basically standoffs that control vibration going to the computer. Less vibration means less noise which is also a good thing. The installation of this unit was actually very easy. I got it right on the first try. Be sure that you remove the fan before installation of the heatsink or you will not be able to install the clips under the fan. The fan is easy to remove and reinstall. Just pull the sides and it will come off easily. I tested the unit against a similar system, the Scythe Kamakiri. The Kamakiri has heatpipes and a fan that sits in the middle of the unit. It does not contain a PWM sensor and I set it to full blast the entire time. The Freezer 7 Pro has a PWM sensor and was enabled as this would be the normal use. I left the MX-1 paste/pad on the unit as this would be a normal heatsink purchase. I will review the MX-1 paste in another review soon. 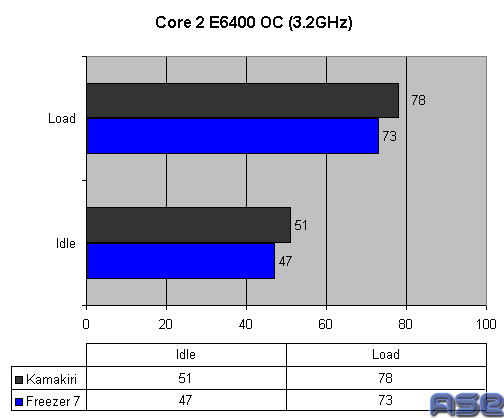 The setup used is a Core 2 Duo E6400 at 2.13GHz (233MHz) and overclocked to 3.2GHz (400MHz). The RAM used was the Kingston HyperX PC-2 9600 2GB set and the motherboard was the Asus P5B-Deluxe. As you can see, the Freezer 7 does a great job against a big and noisy heatsink. I think that the Freezer 7 provides good cooling for the amount of noise produced. I could not hear it over the other fans in my case. With the Kamakiri, I could clearly hear it. The Freezer 7 Pro is great. At a price of $35 (MSRP), it is a great buy. It provided great cooling and a nice and quiet approach to a big heatsink. I am using this heatsink for my personal machine and I recommend it to all that need a quiet cooling solution. There are better heatsinks that are louder but this combines cooling and quiet with a great price. Now try to find it being sold. I had a tough time to try to find one. I would like to thank Patrick Chung from Arctic Cooling for providing this product for review.